I received complimentary items from Evy of California to provide this review. All opinions are my own. Which international fashion icon can boast that her apparel is worn by the best-dressed (and cutest!) little girls in the world? Snoopy’s sister Belle, that’s who! Yes, a new line of Belle apparel for young girls is bringing Peanuts’ signature wit and Belle’s fashionista style to Macy’s this fall. I recently was sent an outfit from Belle's new line and have included it in my Holiday Gift Guide because it is so adorable. They come in sizes 2T to 6, so I asked for a 4T which is my daughter's normal size right now. Evy of California has a ton of cute items. Along with Snoopy and his sister Belle, they also have Hoodsbee (review coming soon)! I am in love with this outfit and SweetPea asks to wear it, so I know she loves it too. And that just warms my heart. I paired it with some cute black boots that my mother-in-law bought and the white bow we got from ShopGCH. I have already washed it by the time these pictures were taken (I still wash everything before she wears it) and it held up very well in the washer/dryer. I was worried that the applique might come off, but there were no issues. It also doesn't restrict any of her movements when worn. I'm VERY excited because I also get to offer one Nanny to Mommy reader the opportunity to give a great gift this Christmas by winning an outfit from the new Belle line! They have two other outfits to choose from that are pictured on the image below. Entry is simple, just follow the prompts on the Rafflecopter below! Open to US only (sorry) and must be 18+ to enter. Giveaway ends 11/10 at midnight. Good luck! Nanny to Mommy received complimentary items to provide this review. No monetary compensation was received. All opinions are my own. Nanny to Mommy is NOT responsible for prize fulfillment. This giveaway is open to US only, must be 18+ to enter. One entry per household/IP address. No social media was involved in this giveaway in any way. Winner is chosen via Random.org through Rafflecopter. ALL winning entries ARE verified. Winner will have 48 hours to respond with all information to email or another winner will be chosen. If you would like to see your product featured in our Holiday Gift Guide, please contact me at Diana.n.chastain@gmail.com. I like the black and white striped outfit in 6X for my daughter. I would pick the 2nd outfit. The grey one. I'd need a size 8. I like the gray outfit in the middle with the purple heart. I would need a size 6 for the 4 year old granddaughter. I love the outfit with the blue shirt! Very cute. A size 5 would be perfect for my middle little. Thanks for the chance! Too cute! I had no idea Snoopy had a sister. I love the outfit in the middle and I'd get 2T. :D Thanks for the chance to win! The teal snoopy outfit, size 5. I like the gray one in the middle in size 5. I would choose the first outfit (the teal one) in a 2T because I love the heats on the pants. i would pick the middle outfit with the gray sweater for my daughter. I'd get it in size 4T. It is so cute and perfect for the fall season! I would pick the 1st - outfit, the one your daughter is wearing in size 6. We love Snoopy & the Peanuts Gang. I like the 2nd outfit, in a size 6 please! I like the second outfit with the gray shirt, love it actually! Size 2T. I would choose the outfit with the purple heart on the shirt in a size 4T for my daughter! I like the black and white outfit on the end, My great niece would love them all, She is forever trying clothes on. She would need a size 6. Thank you. I'd love to get the outfit with the grey top and purple heart and the dark pants in a size 2t. I think I would choose the teal one for my daughter Ina size 5. I love the Belle clothes for my granddaughter size 6. I would choose the black and white striped outfit, I would give it to my niece! My favorite would be the same as the one you received - the turquoise top and the pants with the hearts. I'd like it in size 4 for our granddaughter. The Greg one in 2T! Id love the middle outfit (grey) in size 3T for my daughter - they are all super cute! I love the first outfit- so cute! We'd need a 4T for my daughter. I like they gray with the Purple Heart on it. I would take size 6. I'd choose the middle outfit in a size 6 for my daughter. I love the blue shirt outfit in a size 5. I cant decide between the blue or the gray one! And it would be size 4T. Gosh, they are all so cute! Teal Belle Shirt and heart pants, size 6. I would choose the Teal Belle and Hearts in 4T. I would choose the Snoopy outfit with the blue shirt and I'm not sure of the size I'd have to find out what size my boyfriend's daughter wears. She would look adorable in this outfit. I would choose the Belle top in teal with coordinating leggings in a 3t. Its super cute and looks comfy. My little one would love it! I think I'd go with the middle outfit in 2T for my daughter. I would definitely choose the teal outfit (love that color!) in size 6 for my almost 5 year old daughter. I really like the middle outfit with the grey top and I'd get a 2T for size. I love the middle outfit - featured above - so cute - I would get size 6 for my goddaughter. I love the outfit you chose for your daughter. This would be adorable on my great niece. She wears a size 5T. Thank you so much. I would love size 4. These are so cute! I would pick the same one you chose for your daughter for my daughter in size 3T. Disney Junior's Sofia the First and Doc McStuffins styles every little girls dream of disney stuff to wear. I would chose the 2nd outfit in a size 6. I would choose the first outfit, in size 2T! Love the one with the purple heart in 2t! But they're all really cute. My daughter would love all 3! I think that I would choose the second outfit if I won (the grey with the purple heart). My daughter wears a size 4T as well! I love the grey outfit in 2T (the outfit in the middle), thanks! I love the one with the purple heart! my daughter would be so happy to have one of these outfits! I'd choose the first outfit in the prize package picture in size 6 please. Thanks. 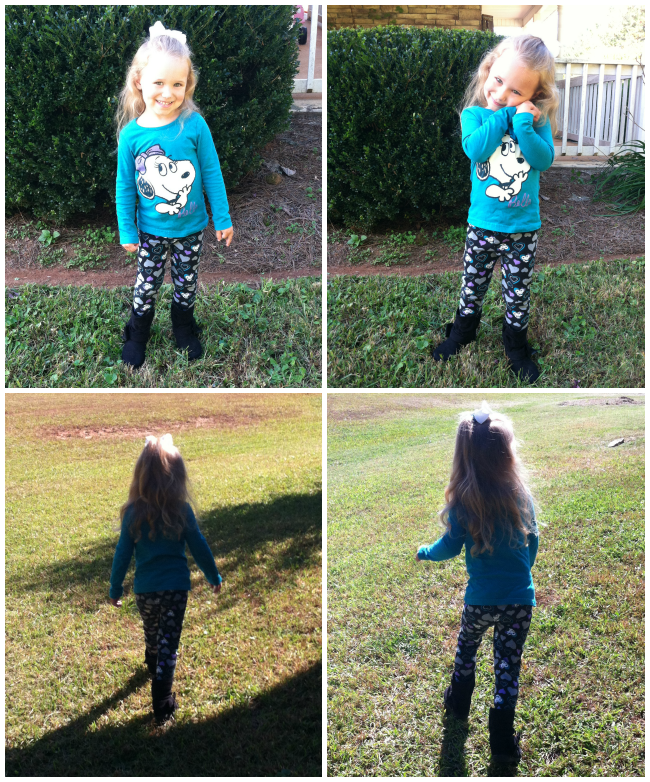 My favorite is the Blue outfit you reviewed in Size 3T! It is so cute on her and would look great on my Niece's daughter. I'd choose the blue outfit in size 3T. It's adorable. I like the first one in size 5. I would like the teal top snoopy outfit in s size 2. I would choose the black & white striped outfit in a size 2t. I would pick the 1st outfit, love the teal shirt! I would need size 2t.